According to this passage of the gospel of Luke, the birth of Jesus begins in a very ordinary way. Everyone is just going about their business. The Roman Emperor wants to collect taxes more efficiently, so he organizes a census. The people who live under the control of the Roman Empire don’t want to get in trouble, so they follow the census instructions. Everyone travels to the town of their birth to be counted, and, naturally, rooms for the night grow scarce. Meanwhile, a baby is born in the stable behind an overflowing Bethlehem Inn. Not so strange — Babies come when they’re ready. They arrive every day. So far in this story, there’s taxes, travel, and birth: common human stuff. We come here, tonight, in the midst of our own ordinary lives. Like the folks in the story, we have to contend with leaders who make choices about our nation. Like the folks in our story, we know what it is to pay taxes, and to travel. Our lives are full, we work and rest and play. We fall in love, receive diagnoses, struggle, fight, grieve, break things, get exhausted, make up, fix what can be mended, and try again. Our lives are full to bursting with ordinary and heartbreaking stuff. Babies are born here every day. How often do we notice the wonder of it all? How often do we take a deep breath, and gaze at life, and notice its beauty? It’s a little daunting, to be asked to notice the good, to notice the God, going on in and around us. The folks in the story tonight aren’t sure what to do. The shepherds, at first, are terrified. Who is this dazzling being? From terror, they turn to curiosity. “Let us go now to Bethlehem and see this thing that has taken place.” In other words, let’s see if this whole thing is actually true. Only once they have visited Mary, and Joseph, and the child, and seen for themselves, do the Shepherds get around to glorifying and praising God. Mary shows us yet another possible reaction to the angelic invitation. Instead of reacting in fear, or seeking proof, or giving thanks, Mary treasures the words of the angels, and ponders them in her heart. No one said awe or gratitude was easy. Still, the angels invite us to try them out. On this holy night, we remember a time when God’s presence on earth was magnified. God shone bright in a star up above. God beamed forth in the face of a newborn. Still, the miracle could have been missed. God does things in surprising ways. She chose a little one with brown skin, from a poor family, in a small nation, to show the world more about who she is. God, you are good, from the beginning of the world. Our lives are a gift from you, and our home is your beautiful creation. Still, there is a lot of pain here, and plenty of ordinary everyday. It’s easy to miss out on the most important stuff in the midst of everything else. Help us to notice the holiness shining forth in our lives: if only for a moment. Urge us on, to ponder it more deeply, and to pour forth our praise. Amen. The beautiful holy story we remember tonight takes place amidst bureaucratic red tape. The Roman Empire needed money, and so it needed to collect taxes. But how can you collect taxes if you don’t know who you’re taxing? The first step is a registration: a census. And for some strange reason, in this story, everyone is counted not where they live, but in their place of origin, in the city from which their family’s male line comes from. It seems like a strange plan to me for organizing a census; but that’s the way our story goes. Joseph’s people were, Luke tells us, from Bethlehem. And Mary and Joseph lived in Nazareth. So Mary and Joseph join the nameless crowds of people that were on the move that season. So many people, traveling by foot or by animal or by cart. So many people, improvising places to stay, and ways to get fed. So many people, standing in lines, and filling out forms. It must have been terribly disruptive and inconvenient and costly and even dangerous for these folks to travel. Still, it was less risky than disobeying the empire. That journey from Nazareth to Bethlehem was not a good time to give birth. But babies don’t wait for bureaucracy. They don’t care about borders, either. They come when it is their time to come. And, as it happened, Jesus was ready to be born. So Mary and Joseph have to do the best they can, in a truly unfortunate situation. 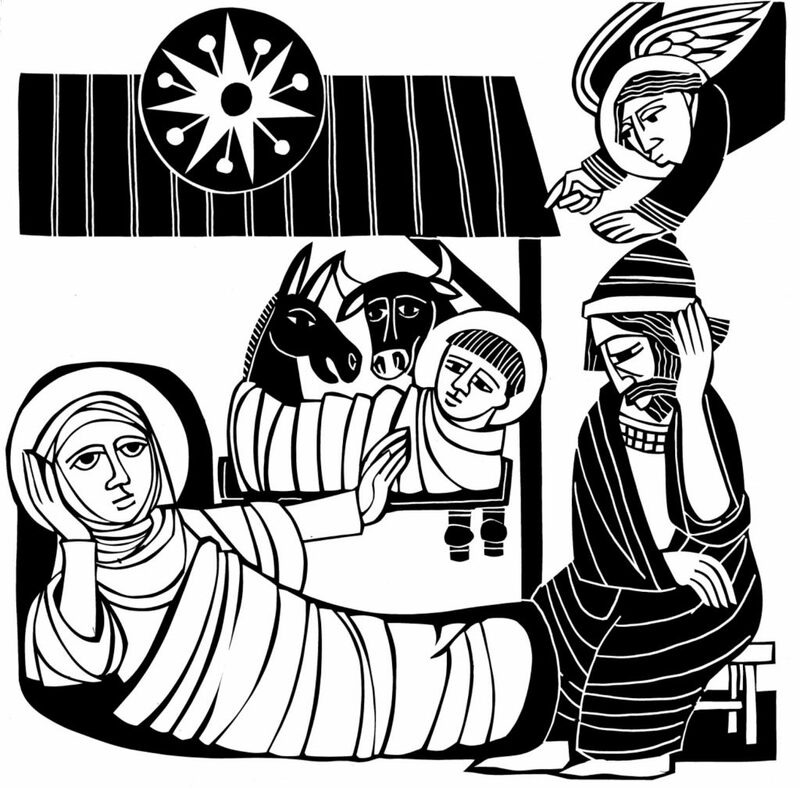 Mary births outdoors, perhaps, or in a stable – the text doesn’t say. And Mary lays the baby in a manger, in a trough made for animals to drink out of – because there is no place for her family in the inn. It’s only one phrase in the story: “there was no place for them in the inn.” But it’s a phrase that helps shape our whole understanding of Christmas. And out of this phrase came the tradition of Las Posadas, which means the Inns, the shelters, the accommodations. For nine nights, in Mexico and in Spain and beyond, communities fill the streets. They follow behind people dressed as Mary and Joseph, and sometimes a real live donkey. They look for a place to stay. At first the Holy Family and their friends are turned away. No, there is no room, you are strangers, we couldn’t possibly help. But then, eventually, each night, the travelers are welcomed in; to a home full of light and food and music, or into a brightly decorated church. The travelers come in to kneel around a nativity, and to pray or to party or both. The last night of Las Posadas is tonight: Christmas Eve. This tradition that we reenacted with children at our five o’clock service tells our holy story in a wonderful way. 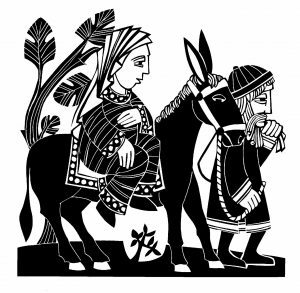 Las Posadas also invites us to consider: who is getting left out today? Who is barring the door? And how can we all work past the very human instinct to distrust a stranger, and welcome holy families, and holy children, into our midst? Unfortunately, it is all too easy to think of people being left out today. We might remember the immigrants and refugees who seek safety and opportunity in our nation, or in Europe. Too many of these precious children of God are spending their holiday season in detention centers or in refugee camps; away from family; in want and in fear. Others are being left out for other reasons. They are not seeking a new nation, but face distrust and discrimination right where they are, because of differences of skin color, culture, religion, wealth, sexual orientation, gender expression, and more. Some say that God sent us Jesus, our Emmanuel, our God-with-us, so that we could finally see the divinity that resides in humanity. It has always been there, of course – God created us, all of us, in God’s own image. But two thousand years ago, we seemed to need a reminder that God’s glory could coexist with the common stuff of human life. So God sent us Jesus. Jesus: in whom the presence of God is so blindingly clear, that it cannot be missed. God wanted to let us know: even in these flawed and humble creatures, in their great complexity and diversity: even in people like you and me, lives the breath of God. When you help the least of these, you are showing hospitality to God herself. In our Christmas story, God is born as a human child in a world of tragedy and injustice and poverty and division. And his birth changes things. Now, Mary and Joseph still have no choice about taking their trip to be counted in Bethlehem. And they can’t change, either, the distrust or dismissal or exhaustion that leads all the innkeepers to turn away a mother in labor. Yet still, through the grace of God, Mary and Joseph find a welcome. Animals keep them company while they cradle their child. Angels are put to work bringing news of his arrival. Shepherds, dirty and rude, come rushing to witness the babe. There’s enough folks for a party, or a prayer service, and good news to celebrate: good news of great joy for all the people. No matter what you witness when you look out into the world today, at Christmas we remember that humanity has been at least twice blessed: by God’s creation of human life, and by the incarnation of God as Jesus. If God made us, and has accompanied us from the beginning; if God came to be with us in flesh and blood; then perhaps we are, all of us, redeemable: capable of recognizing and following the divine within us. Capable of recognizing and honoring the divine within one another. In this beautiful place that is marked by unjust laws and selfishness and cruelty and plenty of our own modern bureaucracy, God keeps gently inviting us into lives that are run by a different logic. Look, God says: see the holy child, filled with everlasting light. Listen to the solemn stillness, and the glorious songs. Observe the tender care of the new parents, the awe of the shepherds, the angels’ watch of wondering love. If all this is true, then perhaps we may find ways to welcome the Marys and Josepsh that come knocking at our doors, heavy laden by life’s crushing load. If all this is true, then perhaps along our own weary roads, we may find rest in the Posada, the inn, of God’s own love. For God is waiting for every wanderer, for all of us – ready to provide some modest but truly warm accommodation, with shelter, and food, and light, and love, and prayer, and maybe even a party. Thanks be to God.